Join the discussion on our forums! 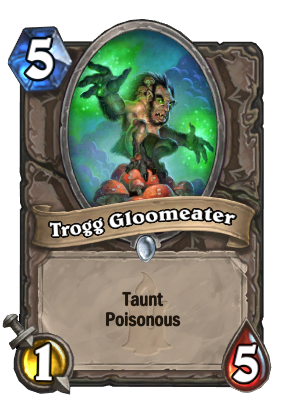 Come discuss Trogg Gloomeater over in our dedicated Trogg Gloomeater discussion topic. His breath smells like agony and despair, which is still better than most troggs. ANND WE GOT OUR PACK FILLER FOR THE EXPANSION, THANKS FOR COMING EVERYBODY, HAVE A GOOD NIGHT! the priest kindly thanks you for his minion. Druid of the Swarm pre-Fandral Staghelmed (This one) and neutral for 3 more mana. I don't think it will see any play, unfortunately. This seems like the 1 attack minion of choice for Master Oakheart. I could see a druid deck running this Master Oakheart with this, Hadronox and Ixlid, or with the dragon hatcher with sleepy dragon to go with hadronox.